Coveskipper is the first of two races that our team hosts, the second being Tritonman. Coveskipper is an Aquathlon – a swim-run – which means no bike racks in transition. Which means setup and breakdown is a breeze. Happy volunteer here. For most races, I try to taper at least a few days before the event, but I blew that this go-round. After missing a few workouts during an unusually busy week, I didn’t want to lose fitness by tapering. So race morning, muscles were pretty sore. And by electing to not “carb up” for the race, burst speed was pretty much non-existent. You could say I had low expectations going into the race. My strategy was to take it relatively easy on the swim and hold zone 4 pace on the run. I’ll be the first to admit that strategy sucked. If anything, the conservative swim mentality spilled over into the race start as I ended up in a sea of kicking feet and thrashing elbows rather than out in the front where I like to be. Coveskipper has a two-lap swim course with a beach turnaround between laps. I exited the water after lap one feeling pretty beat, which by my lackadaisical entry for lap two was obvious to everyone watching on shore. Fortunately, by the time I passed the first buoy, the pack had broken up enough that I could comfortably draft off the leaders without getting hit in the face. After a couple of sighting strokes, I noticed that the swim leaders were my teammates, Barry and Torin. We turned buoy number 2 with Barry and Torin leading neck and neck and me right behind drafting along. Heading into shore, I picked up the pace, positioning myself next to my teammates. We exited the water essentially together, but after missing the first of two timing pads entering transition, doubling back to cross both, getting my wetsuit caught under the timing chip, and stopping to take a breath and drink some water, I left transition quite a bit behind the leaders. Oh well, time to play catch-up. Given my diet and recent training emphasis on longer distance events, I knew I needed to stay beneath lactate threshold, less I’d burn up the little glycogen in my body. I started off holding a 6-minute mile pace with a comfortable two steps in, two out breathing pattern. A San Diego State athlete and I rubbed elbows all the way to the first turnaround, where I counted two other SDSU athletes in first/second and Barry close behind in third. Heading back towards the second turnaround, my rival SDSU athlete pulled ahead, catching up to Barry in the process, now about ten seconds in front of me. I hit the halfway point in 5th place, still holding a comfortable pace. Zack also happens to run a burgeoning blog and Twitter account where he posts updates and selfies like this one–Follow him @Iron_Professor! Last lap. Now I started to descend, aiming to hit lactate threshold somewhere near the last turnaround. I saw ahead of me that Barry was dropping the 4th place SDSU athlete. I hit sub 5:45/mile pace, eventually passing 4th place. Almost to the last turnaround, I catch up to Barry, and we exchange some words of encouragement. We hit the last turnaround with 2nd place in our sight. LET’S GO!!! On a day in which I had not been sore, depleted of glycogen, or botched my transition, second place would have come down to an exciting all-out sprint at the finish. Sunday was not that day. Sorry to be anticlimactic. So, I finished third, Barry close behind in fourth. Overall, a better performance for UCSD than last year when Barry and I took sixth and fifth, respectively. Then, everyone’s favorite part: food. Jason’s grilling, and it’s cheat day. Which means burgers WITH buns. AND non-sugar-free ketchup. Booyah. Everyone’s a winner. 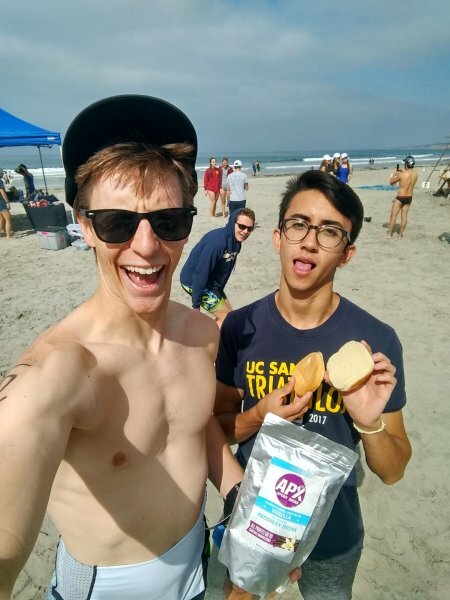 Special thanks to Race-Director Andie for yet another flawlessly directed race, Chris for mad photography skills, APX and Zoot for the podium awards, the UCSD Tri Team for volunteering, and the other teams for coming to our race.